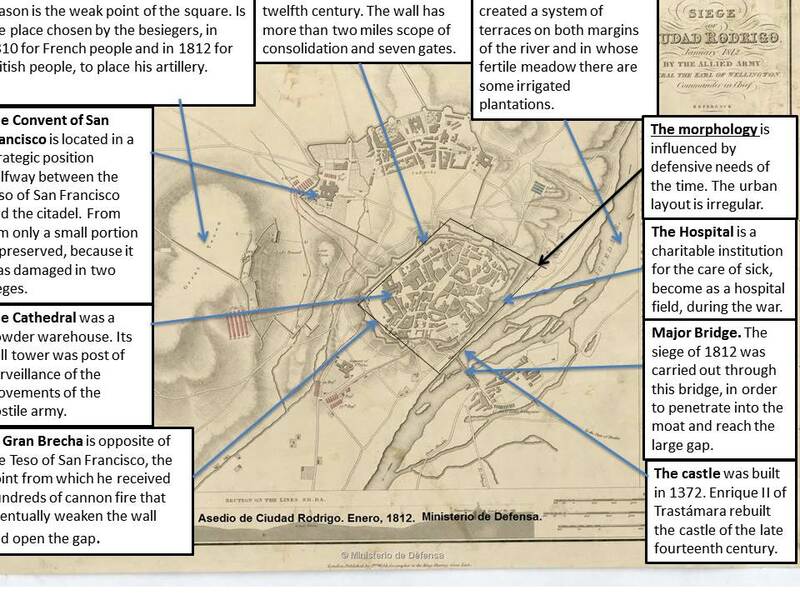 This picture represents the Siege of Ciudad Rodrigo according to a map preserved in the Servicio Histórico Militar of the Spanish Ministry of Defense. This historical event began on the night of 8 January 1812, when 450 men from the Light Division seized the French redoubt on the place of Grand Teson. Many wars destroyed the city, such as the Portugal Secession in the 17th century, the War of the Spanish Succession in the beginning of the 18th century, and the War of Independence against Napoleon, in the beginning of the 19th century. The last one provides the historical event referred to this image. 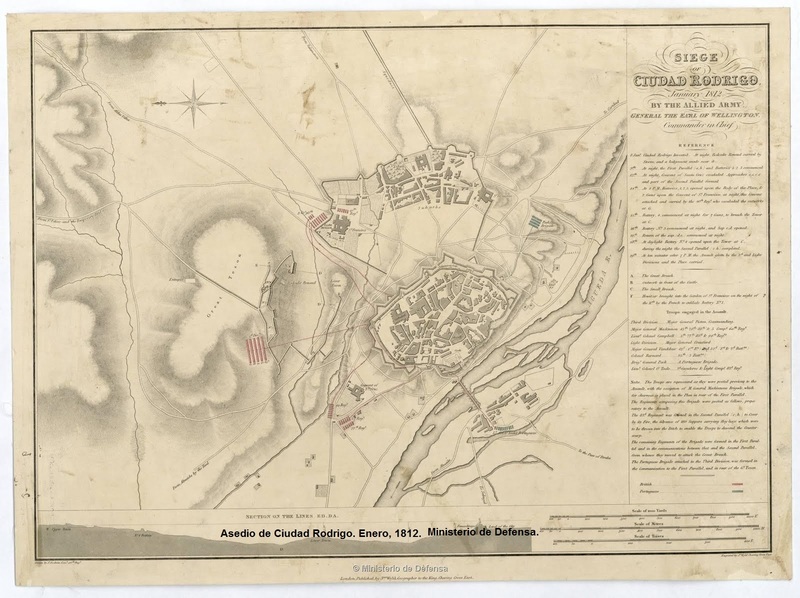 In June, 1810, Napoleon wanted to conquer Ciudad Rodrigo which suffered a hard siege by the French army for several months but the city was finally released by the Duke of Wellington. Ciudad Rodrigo is located in the southwest of the province of Salamanca. It is just a few kilometers from the Portuguese border by the west and also a few miles by the south of Caceres. The city is located on the banks of the Agueda River, a tributary of the Duero that can be seen in the image. The urban setting of Ciudad Rodrigo is due to its strategic position in a border area and therefore is a warfare zone. Agenda River is born in the Gata mountain range and is on the border with Portugal and Caceres. The city was surrounded with a great wall since the Middle Ages and this influenced in the urban layout. The morphology was determined by the defensive needs of that time as we can appreciate in the picture. In addition, the streets are narrow and irregular, and the city center is dominated by the cathedral and the market square that hosted the social activities. The neighbourhoods were divided according the guilds, ethnics or even religious beliefs. In the late 15th century a second city wall was built with large circular towers to house the old enclosure. Outside the wall we can see that there are some suburban areas that have been built up to the present. The 14th and 16th centuries were the most brilliant period in the history of Ciudad rodrigo because many religious monuments and buildings were built. Among the religious monuments, it should be noted the Cathedral and the Cerralbo Chapel, built by Cardinal Pacheco, in addition to the church of the Venerable Third Order or the church of San Pedro-San Isidoro, with a mixture of diverse styles such as Romanesque, Moorish, Gothic, Renaissance and Neoclassical. The Franciscan convent was constructed in the 20th century outside of the Citadel because it turned out to be much damaged during the War of the Independence. Among the civil buildings we can include several palaces such as the Eagle House, the palace of the Marquis of Cerralbo and the House of Castro. Also interesting are the City Hall and the Hospital of the Passion, one of the oldest hospitals in the world that continues serving; this hospital has its origins in the 16th century when was built over the Jewish quarter. Finally, among the military buildings we can include the castle, built by King Henry II, and the moat and wall that are perhaps the most important monuments and were commenced in the twelfth century. Another monument that we can see on the map is the Castle. The name of who had it made is unknown, but the castle was rebuilt by Fernando II. It was attacked on several occasions during the fighting that devastated Castilla y León throughout the Middle Ages. It was rebuilt by Henry II Trastámara, in 1372) During the War of the Spanish Succession and the War of Independence it was again the scene of struggles, up to be completely dismantled. Finally, when this was again restored, it was converted into a fantastic Parador hotel. This entry was tagged Ciudad Rodrigo. Bookmark the permalink.